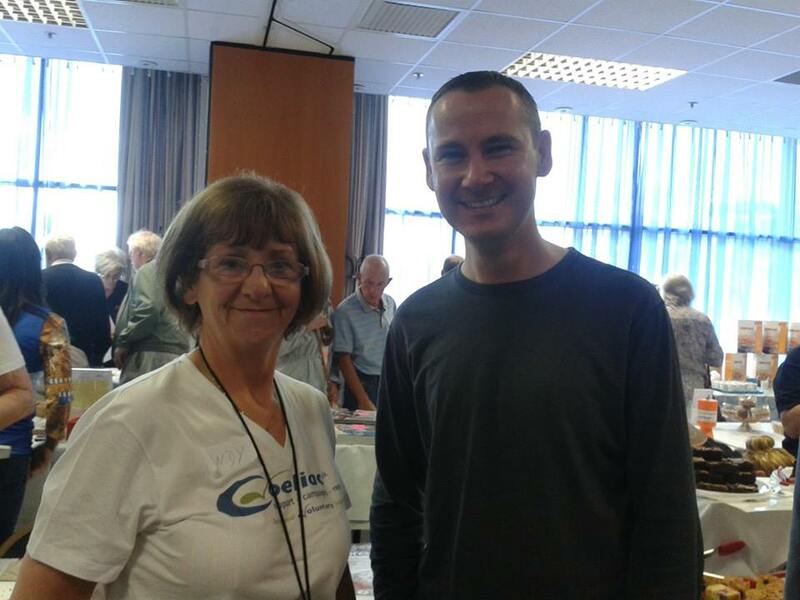 The Coeliac UK Plymouth Group are holding their AGM at the Elm Community Centre on Saturday March 15th from 1pm. The Elm Centre is situated next to ASDA in Estover, Plymouth. Following the formalities of the AGM (apologies in advance to anyone who has to listen to me speak!) there will be a gluten free food fair with eight fantastic local gluten free suppliers/producers in attendance, as well as a couple of craft stalls. This will be another great opportunity to meet and talk to these great businesses as well as stocking up on some fantastic food. There will also be tea and coffee served, free samples and of course a raffle with some great prizes. Non-members are more than welcome to come to the event and I hope to see lots of Gluten Free by the See readers there. 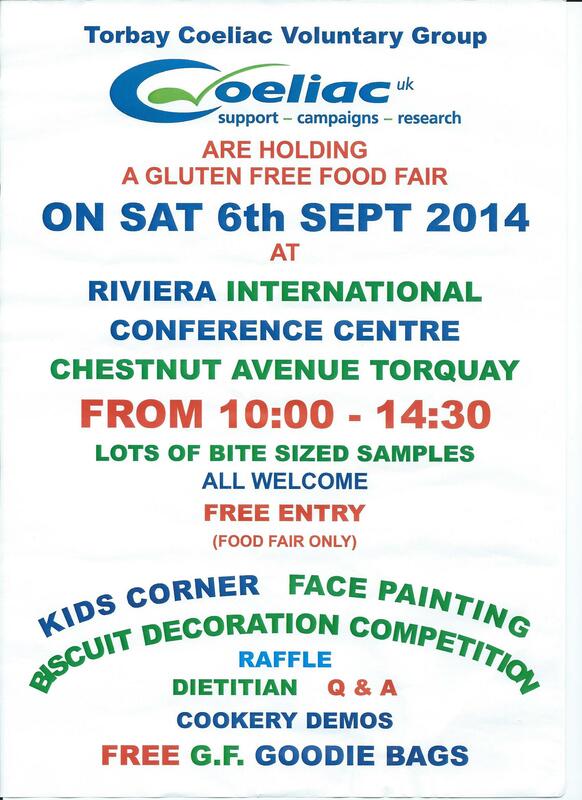 For full information, please see the details that have been sent out to Coeliac UK Plymouth Group members below. The Coeliac UK Plymouth Voluntary Support Group invite you to join us at the ELM Centre, ASDA Plymouth, for a short meeting in which we can update you on progress and complete the formalities of the Annual General Meeting. For new members we will be available to give help with such things as prescriptions and best places to purchase gluten free products. Committee member Suzanne Stephenson will be available to give advice to parents of coeliac children. After the short meeting a Gluten Free Food Fair will be held. This will be a great opportunity to stock up on gluten free products from some of the finest local suppliers. Present will be Traditional Puddings, Clare’s Gluten Free Catering and Love Free From who sold at our previous Elm Centre meeting in November. They will be joined by Let Them Eat Cake, St Maurice Bakery, Soupy Do, Alison Carter from Tavistock Country Market and Cupcake Universe. We are organising a raffle with some excellent prizes such as some gluten free beer from CELIA Lager, a prize from JDs Grill and many more. There will also be a range of free samples available. In the Elm Centre we will again have use of the excellent kitchen facilities, were teas, coffees, biscuits and cakes will be available. For all the bakers out there, we welcome you to bake and share with other members. There will be a £1 voluntary entrance fee to the meeting and members are also encouraged to bring unwanted prescription items for new members. We are looking forward to seeing you on the 15th March 2014. Doors will open at 1pm with the meeting starting at 1:30pm. The food fair will then run until 4pm. We sincerely hope you can attend, and trust you will have a great time. The ELM Centre is located in Estover, Plymouth, adjacent to the ASDA Store. If stood at the ASDA main entrance, turn right down the steps and the centre is at the far end of the courtyard. Full address is Leypark Court, Leypark Walk, Plymouth PL6 8UE. There is some community centre parking available, otherwise you can park in the overflow ASDA car park for 3 hours. Drive straight on rather than turning right into the main car park. The number 50 City Bus runs regularly to the ASDA store. You can catch the 27 or 27a if travelling from the City Centre. After some discussion at committee meetings we have decided to hold our meal out during this year’s Coeliac UK Awareness Week which runs from May 12th to May 18th. This allows us more time to properly plan the event and also gives the opportunity to attract some publicity during Awareness Week. The meal will be held May 12th at JDs Grill in the city centre. We are finalising plans now and will give an update shortly. I am pleased to be able to bring you further news of the Christmas ‘Free From’ Food Fair at Ivybridge Community Market on December 7th, running from 9:30am until 2pm. The event promises to be fantastic, and will be a great opportunity to stock up on some sweet and savoury ‘free from’ products from some amazing local producers. As well as fellow organisers Simply Moorish, Love Free From and Plymouth Greengrocer there will be a host of other Gluten Free by the Sea friends with stalls. These include Traditional Puddings, St Maurice Bakery and Let Them Eat who have featured on this blog, and Kay’s Cakes who I had the pleasure of meeting at the recent Torbay Gluten Free Food Fair. You can find the event at Unit 3, Glanvilles Mill, Ivybridge, PL21 9PS. Parking is available in the adjacent Glanvilles Mill Car Park. If you are a ‘free from’ trader there is still time to book a spot, see here for more information. One quick disclaimer from me; the event is a ‘free from’ food fair and not a ‘gluten free’ food fair, so when buying and tasting products please please do ensure that they are free from your specific dietary restriction. For example some items may be dairy free rather than gluten free. There will of course be lots of choice for the coeliac and gluten free folk like myself. So a big thank you to Helen Jones and the Ivybridge Community Hub for hosting this event, it really is a great opportunity for us. I hope there is a great turn out, so please share this post to all your free from friends and make sure you come along on the day. If this fair is successful then hopefully it will be the first of many! The Home from Home Community Hub in Glanvilles Mill, Ivybridge. 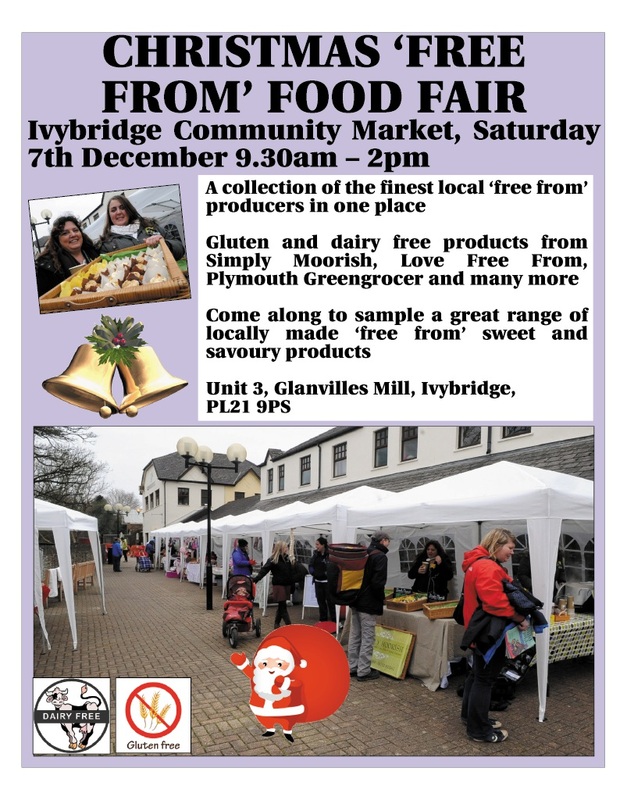 who also run Ivybridge Community Market with a network of volunteers, are proud to announce their collaboration of free from producers to bring you a ‘Free From’ Food Fair on Saturday 7th December 2013 9.30 – 2pm at Glanvilles Mill. Helen Jones of Simply Moorish, Kevin Gollop of Gluten Free by The Sea and Secretary for Coeliac UK Plymouth Group, Emma Louise Hutchinson of Love Free From and Julie Petvin of Plymouth Greengrocer all recognise and pioneer to ensure a wide variety of produce is made available to those with food intolerances and sensitivities. This unique collaboration has enabled a ‘Free From’ Food Fair to be coordinated for all to enjoy with free tasters and samples, homemade and local produce available for the run up to Christmas. All coordinators have been able to bring together a great range of traders to provide a variety of products to suit all palettes and dietary requirements, including gluten and dairy free. There will also be a raffle taking place with great ‘free from’ products and gifts from local traders, and prizes from national brands such as ilumi and Honeybuns Bakery. The proceeds of which will be split between Allergy UK and Home from Home Community Hub (a not for profit organisation). Glanvilles Mill is a retail unit nestled in the heart of Ivybridge town centre easily accessible within a very short walk from several car parks, providing convenience and variety only minutes from the A38 Devon Expressway. The atmosphere is unhurried, friendly and you’ll receive great personal service within its shops.